Fields of Fire is a solitaire game of commanding a rifle company between World War II and Present Day. The game is different from many tactical games in that it is diceless and card based. There are two decks used to play. The Terrain Deck is based on a specific region and is used to build a map for the various missions your company must perform. The Action deck serves many purposes in controlling combat, command and control, various activity attempts. The units of the company are counters representing headquarters elements, squads, weapons teams, forward observers, individual vehicles or helicopters. A single playing is a mission and several missions from an historical campaign are strung together for the player to manage experience and replacements. A mission can be played in about 1 – 2 hours. This game is based on three actual campaigns experienced by units of the 9th US Infantry in World War II, Korea, and Vietnam. "Keep Up the Fire" is the motto of the 9th Infantry, known as the "Manchus" for their service in the Boxer Rebellion. The other thing that drew me to this game was that it was designed by Ben Hull and active duty Marine. How cooler can that be! But unfortunately the early feedback about the rules sent this to the bottom of my purchasing list. 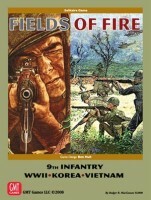 So years went by and Fields of Fire called to me again when I saw it had reorganized and cleaned up rule book (which can be down loaded from GMT website) and was on the P500 list for reprint at GMT. I placed my P500 order and waited. The wait was too long for me so I got a copy of first edition sealed from Ebay and played with my down loaded rule book. (btw, I left my pre-order up at GMT, I have no problem getting another copy). So let’s get onto my review. Ok, I’m sure how I can say this. Replay value is huge, I mean huge. There are so many variables in this game that no one game will be like the last game you played. It covers 3 periods or warfare, WWII, Korean and Vietnam. It based on the experience of the 9th infantry division for all 3 periods of war. I can’t stress enough that this game has massive replay value! o	The cards are of very good quality and stock. o	These are what make up the game board. Same quality and stock as the Action deck. o	New version updated and laid out well. o	Contains all the scenarios. o	Pad of paper for logging and keeping track of your units. o	Just a player aid card. o	Large Size – Two-Sided, nice glossy and colorful. o	Lots of these, same quality as the unit counters. One note about the components, there are decks and counters for each theater of war. I think that this game could of easily been turned in to 3 separate games, but GMT made it so you got it all in one game. I think that’s pretty sweet. Ok, this is where it can get a bit clouded. With the new updated and reorganized rulebook learning the game can still be a somewhat daunting. With that said there are plenty examples of videos game play, one can be found right on GMT website. Examples of game play book and there are plenty of other sites dedicated to fields of fire. With that said with a little work this game pays off greatly once you get the rules down. I have to admit, my first run through of the game I was a bit put off, but after some reading the examples of game play and a video or 2, I’m not a pro but I can finish a game with a satisfying sigh. I’ve yet to stray to Korea or Vietnam…But I can’t wait for the challenge. So in a nut shell, if like to play solo and want to play the role of a captain commanding his troops and your subordinates including staff officers, the company executive officer and 1st sergeant, and your platoon commanders. More often than not, you have three platoons under your command, each consisting of three squads. You also have other units attached to your company some all the time, such as machine gun teams, and others on a mission-by-mission basis. And command, control and communication and intelligence are vital to this game. And you’re interested in history, and the 3 periods of war (WWII, Korea, and Vietnam). And single US 9th infantry division is used thru out the theaters of war. And you like a challenge, and then this game is for you! Add a Review for "Fields of Fire"